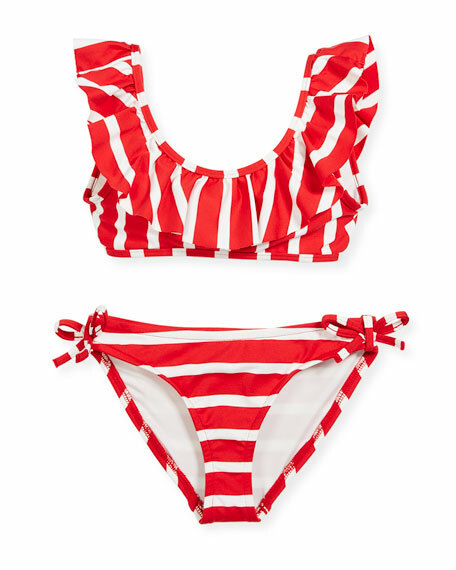 Milly Minis pinafore two-piece swimsuit in striped microfiber. Hipster sides with tie detail. From the New York design house Milly by Michele Smith, the Milly Minis children's clothing collection was launched in 2011. Often inspired by the women's collection, Milly Minis designs feature lively colors and fun patterns with an inspired vintage vibe. From exquisite party dresses to quirky everyday wear and everything in-between, your little princess will love being a Milly girl. For in-store inquiries, use sku #2427716.